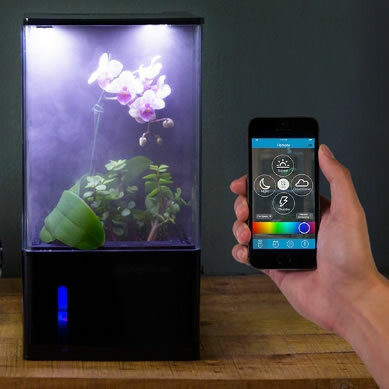 The EcoQube Air is a user-friendly ecosystem that functions as a greenhouse, humidifier, air filter, air circulator, circadian-rhythm and light-therapy device to improve air quality, light biology, and plant growth. It incorporates hydroponics, which produces high yielding, abundant plants. The greenhouse requires minimal maintenance, and automatically begins working once it’s plugged in. The aesthetic properties of greenery can greatly affect a person’s wellbeing. Improving mood, reducing stress, increasing focus and efficiency are just a few benefits; but maintaining the life of a plant can be tedious. The 8″ x 8″ design makes the process much more user-friendly and low maintenance. The soilless system avoids the annoyance of pests and having a messy space. EcoQube Air also utilizes ebb and flow technology that ensures the perfect amount of water gets fed to the plants’ roots; by periodically pumping in water and then discharging the water out via an auto-siphoning drain spout. ADI’s Kickstarter campaign offers pre-order discounts and other backer incentives. Funds from the campaign will be used to complete manufacturing and commercialization of the EcoQube Air that is slated to be on the market January 2017. Prior to the EcoQube Air, ADI launched the original EcoQube and EcoQube C desktop aquaponics systems on Kickstarter to raise awareness for innovative solutions that solve food and water shortages. The products use plants to naturally clean and filter the aquarium water. The EcoQube Aquarium is now commercially available. “Our Global CleanTech Fund along with the advisory of Global Trust Group Alternative Investment Board invests as a venture management partner to assist successful founders like Kevin Liang with key environmentally enhancing technologies like the EcoQube at ADI to expand and maximize domestic and global market opportunities, that, for us, we see as the next generation in its respective space,” said Robert M. Sigler, Manager of Global Trust Group. The seed funding raised will provide working capital as ADI expands its market leadership and execution of expanding its growing product pipeline. San Diego-based Aqua Design Innovations (ADI) creates living decorations that shape the future of indoor environments. Humans were made to be in nature. But in today’s modern age, we spend a majority of time in sterile, stagnant environments. ADI’s mission is to transform living spaces by blurring the lines between outdoor and indoor environments one product at a time. For more information, please visit http://adiventures.net.